We are pleased to announce the repeat mating of Roo and Boudreaux due October 6-12, 2016. We’ll be accepting a few pre-litter deposits on this upcoming litter now in order to reserve them until they're ready to go to their new homes at 8 weeks old. These puppies will be $1035 each. These puppies do not come with any registration papers the Sire is registered, but the Dam is not! BOTH parents and Grand parents are Dutch Shepherds and NOT a Malinois/Dutch Shepherd cross like a lot of the Dutch Shepherd puppies for sale on the Internet! Both Mom and Dad are very out-going and VERY protective of us. They both are very affectionate and have great prey/hunt drives! 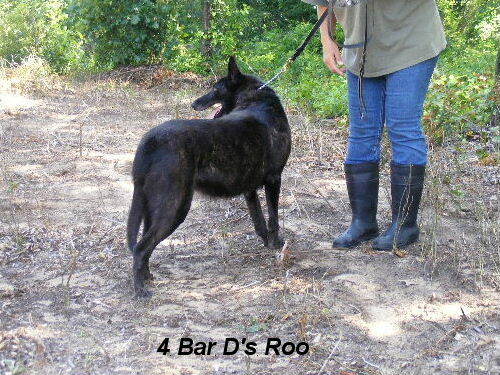 Boudreaux's an outstanding CKC registered very dark Black Brindle male short haired Dutch Shepherd. He stands 26 inches at the shoulders and weighs approx. 85 pounds. He's very playful, loves to be with us and gets along with both males and females. He loves everyone he meets and will want to show you his favorite toy, a large riding lawn mower tire. Boudreaux's Sire is BLACKJACKS'S RICKY PH-1, his Dam is BLACKJACK'S NUVO. Boudreaux's Grandsire on his Sire's side is ANDO KNVP PH-A PH-2 and his Grand Dam on his Sire's side is SASKA PH-1. 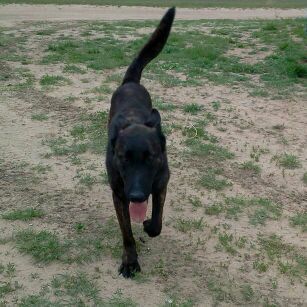 Roo is a short hair Dutch Shepherd that weighs 75 pounds and stands 24" at the shoulders, she's very out going and has an awesome prey drive. We expect these puppies to have the same temperament as both parents and suitable to be used for any job they're given! Things that potential owners need to know about this breed are that Dutch Shepherds are loyal, reliable, alert, watchful, active, independent, intelligent, and intuitive. Obedience through modest specialized training and discipline can achieve remarkable results. Gifted with a true shepherding temperament, they work willingly together with their owners and can deal independently with any task they are assigned. They are neither aggressive nor shy. Dutch Shepherds have a strong character and independence passed down from their herding ancestry. Their owners need to be strong yet fair leaders. Although their character and traits suggests a strong potential for doing police or military work, care should be taken that this breed's seemingly sole purpose is not overlooked for its otherwise well-rounded character. 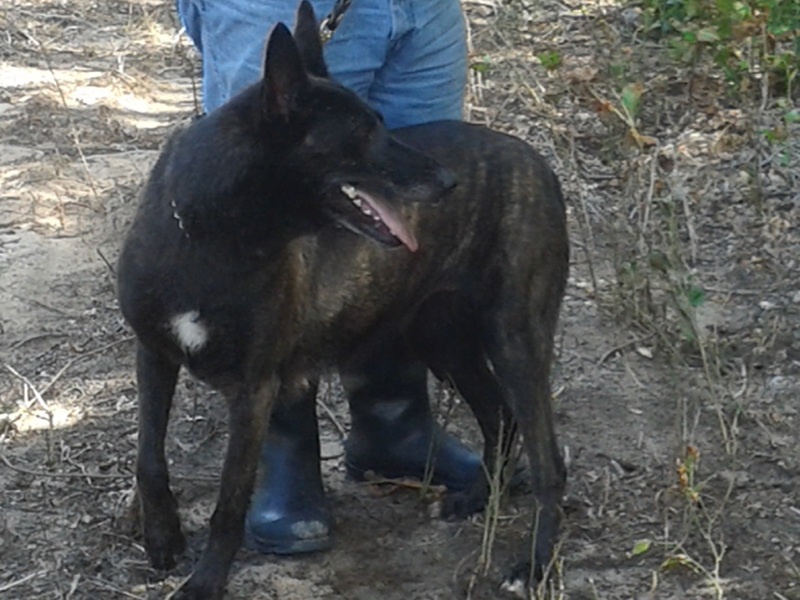 While there is no perfect dog for everybody, the Dutch Shepherd needs an active working lifestyle and an owner willing to make a commitment of proper socialization and training. Once the bond of trust is developed between the Dutch Shepherd and owner/trainer, their enthusiastic and intuitive nature needs little incentive or command to get them to follow through. The Dutch Shepherd is an active and versatile breed. They compete in dog agility, obedience, Rally obedience, fly ball, dock jumping, disc dog, tracking, search and rescue, protection sports such as Schutzhund, French Ring Sport, Mondio Ring and Service Dogs of America. In The Netherlands it is still employed as a herder and the instinct is still strong in the breed. Internationally, the Dutch Shepherd is best known for use in law enforcement under the KNPV program. The Koninklijke Nederlandse Politiehond Vereniging (KNPV), or Royal Dutch Police Dog Association, was founded 27 October 1907, as an organization to oversee and test dogs for their suitability for police work. 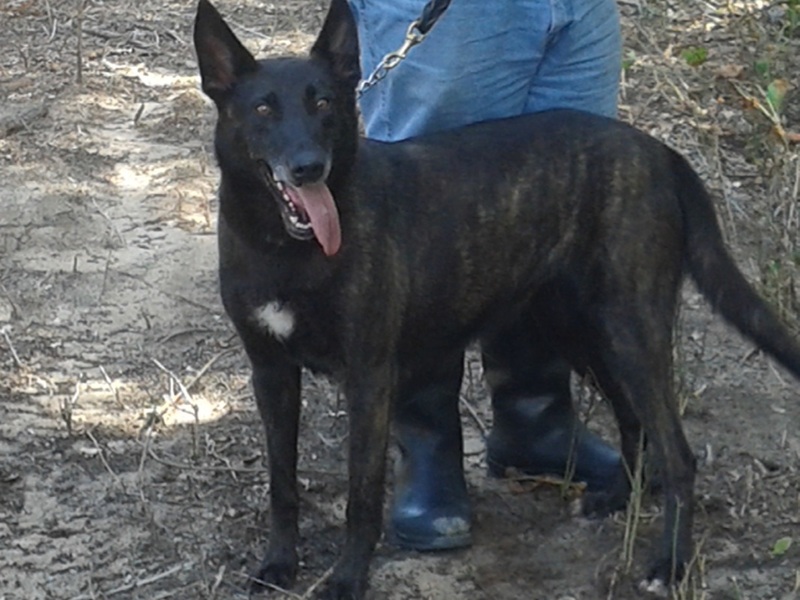 Dutch Shepherds with KNPV titles are sought after candidates throughout the world for police and military use, as well as sport competitors and personal protection dogs. We do screen prospective buyers before we send a puppy out. 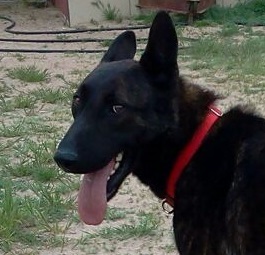 Dutch Shepherds are high energy dogs and need to have some type of formal training, at minimum basic obedience. They need to be socialized with everyone and exposed to everything possible in order to become a well-rounded dog. This is not a breed that you just buy and put in the back yard and forget about them. They are very out-going in nature and very easily trained. They'll do anything you want them to do for a word of praise and a good brisk rub and a pat on the head. All of our puppies come with a 1 year Health Guarantee, Health Records, current puppy vaccinations and current de-wormings starting at 2 weeks old. They also come with a Puppy Starter Kit and a Life-Time of Breeder Support. These puppies will have their dew claws removed. We ship our puppies with United throughout the United States of America, and some airports in Canada. We ship to the following states in the USA: Alabama, Alaska, Arizona, Arkansas, California, Colorado, Connecticut, Delaware, Florida, Georgia, Hawaii, Idaho, Illinois, Indiana, Iowa, Kansas, Kentucky, Louisiana, Maine, Maryland, Massachusetts, Michigan, Minnesota, Mississippi, Missouri, Montana, Nebraska, Nevada, New Hampshire, New Jersey, New Mexico, New York, North Carolina, North Dakota, Ohio, Oklahoma, Oregon, Pennsylvania, Rhode Island, South Carolina, South Dakota, Tennessee, Texas, Utah, Vermont, Virginia, Washington, West Virginia and Wisconsin. Shipping usually runs about $375.00, but is based upon the size and weight of the puppy when shipped. Shipping covers the cost of the air fare, new shipping crate that you keep and the required Health Certificate issued by our Veterinarian. Basically all you do is Select your puppy, Pay for him and Pick him up at your airport. We are required by the state of Oklahoma to have your puppy micro-chipped. The cost of the microchip is included in the purchase price. (You can opt out of having your puppy micro chipped for religious reasons, ask for details). We can ship two puppies together in the same shipping crate to save a little more on shipping costs, we can explain how this works if you contact us. Please call us before you place a deposit on the Dutch Shepherd. Since we know the personalities of the parents, we are happy to assist in trying to find a puppy for you that will work for your needs.